Arizona Cardinals Helmet Riddell Pro Line 2005-Current Year - Login for SALE Price | Sports Memorabilia! 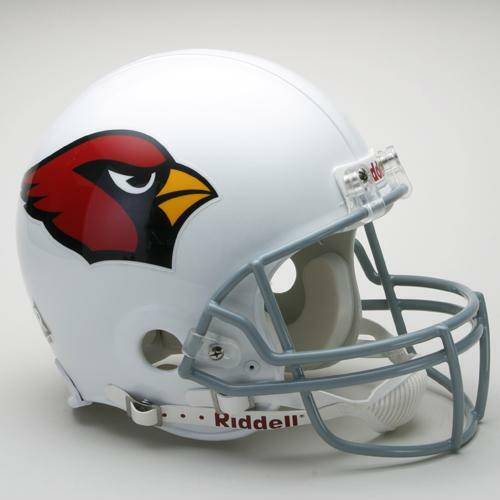 This Arizona Cardinals helmet logo has been worn on the field from 2005-Current. Every Arizona Cardinals helmet is officially licensed by the NFL. Each Arizona Cardinals VSR4 Pro Line helmet features a Kra-Lite II Polycarbonate Lexon shell, an inflatable liner with two inflation points, a steel polyvinyl-coated Z2B quarterback/running back style facemask and a four point chin-strap. All VSR4 Pro Line helmets, including this Arizona Cardinals helmet, come with official team colors and decals.